In a way of subverting the ban, salmon from Norway is first imported by Russian businessmen to Belarus, where it is gutted and salted at local factories, after which the processed fish is transported into Russia. Despite the ban on the import of Norwegian salmon, lightly-smoked salmon fillets have not disappeared from Russian stores, as resourceful suppliers exploit a legal loophole in order to circumvent the ban on fish imports from Norway. Most Russian companies selling fish now cooperate with Belarusian companies in order to get around the ban on European food imports imposed by Moscow in retaliation for EU sanctions on Russia over its support of pro-autonomy militants in eastern Ukraine. According to Alexander Starobinsky, deputy managing director of the St. Petersburg-based holding company ROK-1, fish from Norway is first delivered to Belarus, where it undergoes primary processing (gutting and pickling) before being shipped to Russia. The ROK-1 website says that the company has an annual output of 60,000 tons, with a product list consisting of over 400 items, including specialty fish, crab sticks, and caviar. ROK-1 is using the same scheme, Starobinsky admits, without, however, disclosing any details. “After the sanctions were introduced, we traveled all over Belarus in search of a local fish processing factory to buy. But in the end we decided simply to place orders there since we expect the sanctions to be lifted soon,” says Konstantin Petrov, commercial director at another fish company, Baltiysky Bereg. Petrov refuses to disclose where in Belarus the company places its order and in what amounts, citing commercial secrets. According to its website, Baltiysky Bereg is one of the top five “federal companies in this segment.” The company’s output features over 150 products, made at Baltiysky Bereg factories in St. Petersburg and the Leningrad and Murmansk regions. Bans on fish imports from Norway have been in place in Russia since Aug. 7: The country and the product are on the anti-sanctions list adopted by Prime Minister Dmitry Medvedev for a year. However, fish imports from Norway to the other two countries of the Customs Union – Belarus and Kazakhstan – have not been banned. Although raw fish cannot be transported from these countries to Russia since its country of origin remains Norway, if the fish undergoes some processing (for example, raw fish is salted) and is packaged, it becomes a Belarusian or a Kazakh product and is no longer subject to any restrictions. For example, in Belarus, Norwegian salmon is given a new foreign economic activity code, which is used by Russian customs: It is transferred from the designation 0302 (“chilled salmon”) to 0305 (“salmon fillet with minimum 3.5 percent salt content”). 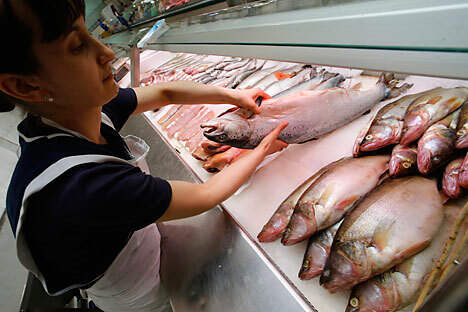 Fish consumption in Russia in 2013 stood at 2.8 million tons, with over a third of that amount imported. The biggest exporter was Norway, accounting for nearly 40 percent of Russia’s fish imports. According to the Norwegian Directorate of Fisheries, in 2012-2013, Russia was the biggest importer of fish and seafood from Norway. In 2013, Norwegian exports of fish to Russia grew by 10 percent, reaching approximately $1.06 billion. A representative of a fish processing company has told RBK that, compared with the period when fish imports could come directly to Russia, his costs have increased by the amount of the commission fee he pays to his Belarusian partners. According to other RBK sources, their costs have risen by 15-20 percent. In September, according to the Norwegian Seafood Council, the average price of Norwegian salmon on the world market was $5.3 per kilogram, whereas in October, according to Custom Inform, Russian buyers were purchasing salmon at $9.2 per kilo. According to RBK sources, the delivery of one 16-ton lorry of Norwegian fish to Belarus costs $5,000-6,000. The end price for the client also has the commission fee for the Belarusian partners, certificates and packaging factored in. These deliveries could be halted by Rosselkhoznadzor (the Russian Federal Service for Veterinary and Phytosanitary Supervision) but only if there is something wrong with the papers accompanying them. “We are interested only in the veterinary certificate and the results of spot checks. Customs codes are not our remit,” says Rosselkhoznadzor representative Alexei Alexeyenko. “The fishing business, unlike the others, has been very particular about complying with the sanctions restrictions. If in order to be brought into the country fish needs to be salted, this is what they do. It is absolutely legal,” says executive director of the Russian Fisheries Union, Sergei Gudkov. In his estimates, since the food embargo was introduced, some 80 percent of the preliminary processing of chilled salmon has been moved outside Russia.